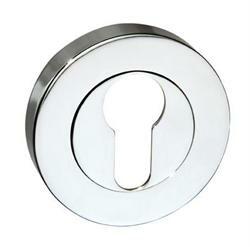 Euro Escutcheon to match Mediterranean range handles. Available in Satin Nickel/Polished Chrome, Satin Nickel/Polished Nickel, Satin Nickel, Polished Brass and Polished Chrome. Be the first to submit a review for the Euro Escutcheon.